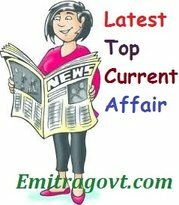 Current Affairs Question 2017: Looking for 28th July Current Affairs? Then start your Quiz right now by answering them. Here in this article, we are giving the Current Affairs Quiz with Questions and Answers. As many people are preparing for various government exams it became mandatory for them to get a grip over the current affairs as in most of the tests are based on Daily Current Affairs. By taking this kind of Current Affairs Quiz candidates can eventually get hold of what they have been working on. Contenders can trust us as we will update all the latest Current Affairs in this quiz. For more such quizzes check our site Emitragovt.com regularly as we will update the Daily Quiz for current affairs. 1. Leading bourse BSE joined hands with Egyptian Exchange (EGX) for cooperation in exchange of information across business areas. 2. Wipro Limited partnered with Hewlett Packard Enterprise (HPE) to offer IT infrastructure solutions in a consumption-based or pay-per-use business model for enterprises. 3. World-renowned singer, Geoffrey Gurrumul Yunupingu, died. He was 46. 4. The Union Government introduced a mobile app ‘Aarambh’ for road maintenance. Aarambh is a mobile phone based app for performance based maintenance contracting and community contracting for maintenance of rural roads. 5. Mervyn Rose, who won two grand slam titles and a pair of Davis Cups for Australia, died. He was 87. 6. Union Finance Minister, Arun Jaitley released a Case Study on the birth of the Goods and Services Tax (GST) in India – ‘The GST Saga: A Story of Extraordinary National Ambition’. 7. Facebook has acquired a US-based start-up Source3 to prevent piracy. 8. Chief Editor of Greater Kashmir Fayaz Ahmad Kaloo has been elected as the first president of Kashmir Editors Guild (KEG). 9. West Bengal Chief Minister Mamata Banerjee conferred this year’s ‘Mahanayak Samman 2017’ to veteran actress Shakuntala Barua for her contribution to the world of cinema. 10. Reliance Defence and Engineering Limited (subsidiary of Reliance Infrastructure) launched its first two Naval Offshore Patrol Vessels – ‘Shachi’ and ‘Shruti’ – at Pipavav, Gujarat.